What Kind of Materials Should I Use For My Deck? “Everybody in the pool!” Is that what you’re shouting out this summer because you don’t want people to notice your drab, worn and cracked concrete pool deck? As long as the concrete is still structurally sound, there are several options you can take to repair your pool deck and prevent it from being an eyesore. Depending on the condition of the concrete and your budget, they range from a simple color enhancement by applying a coat of stain to total resurfacing with a decorative overlay. Before beginning any pool deck repair project, the first and most important step is to figure out what caused the damage and then determine the best repair procedure for solving the problem (read this troubleshooting advice). For the best results, you’ll need to remove all unsound concrete and fill in noticeable cracks before completing the repair. If your pool deck is not sloped probably or is settling, you’ll also need to divert the water runoff and re-level the surface. If your pool deck is experiencing cracking, scaling or spalling, the best solution is to resurface it with a concrete overlay or microtopping. Resurfacing will not only cover up the existing flaws, it will also upgrade the look of your pool by allowing you to add color, texture, and pattern. Some systems are designed specifically for resurfacing pool decks, and will improve the slip resistance of the surface and reflect heat. See What Type of Pool Deck Overlay Will Stay Cool? For concrete with minor cracking or discoloration, you can completely disguise the flaws by engraving or cutting a pattern in the surface. Depending on the pattern you choose, the flaws in the concrete can actually contribute to the look. With engraving, the concrete is stained first and then a special routing machine is used to cut the pattern into the surface, creating faux grout lines. See examples of concrete engraving. Although most concrete stains, color hardeners, integral pigments and other coloring methods are long-lasting and wear-resistant, years of neglect can take a toll. Discoloration of concrete pool decks can be due to a number of causes including weathering, sun exposure, improper color application, and attack by pool chemicals. The good news is that in most cases the concrete color can be revived by applying a new coat of acid or water-based stain. 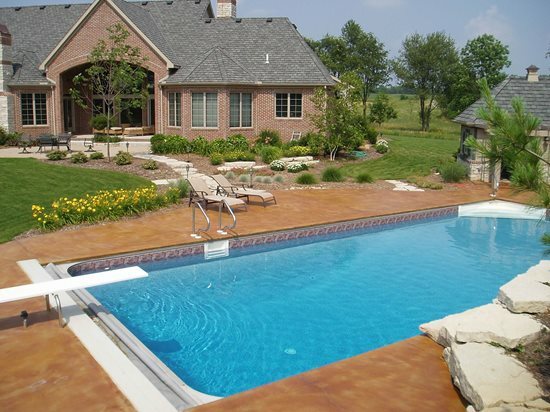 By using a UV-resistant staining product and by protecting the concrete with a good sealer, your newly colored pool deck should maintain its beauty for many years. For more information on choosing and applying concrete stains, read these Stained Concrete FAQs. A microtopping enhanced by decorative brick-patterned borders and stenciled designs gave this dysfunctional pool deck new life. Before the topping could be applied, large cracks in the deck were repaired by stitching and filling them with mortar, and then a swale was installed to help correct a drainage problem. 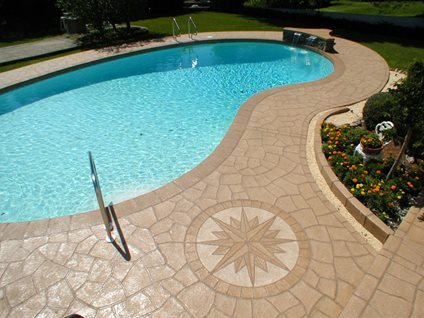 A cast-in-place concrete overlay, stamped with a fieldstone pattern and a decorative medallion, completely restored this deteriorating concrete pool deck without the need for replacement. Because the existing concrete deck had extensive cracking and settlement, the overlay was poured at a 1 ½-inch thickness and reinforced to prevent failure. 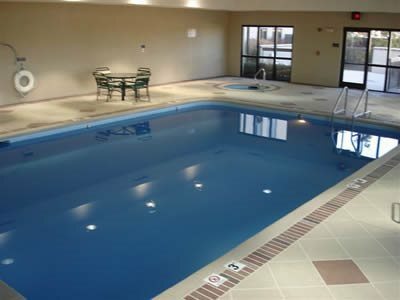 In addition to chemical and hard water stains, this indoor hotel pool deck had a rough surface that was unfriendly to bare feet. The solution was to resurface it with a durable and attractive acrylic topping and add a brick-patterned border to define the edge of the pool and improve the visibility. 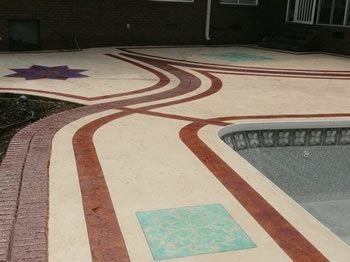 For this pool deck makeover, vine designs colored with water-based acrylic stains were used to turn cracks into unique focal points. The surface was also given a random flagstone pattern created by sawcutting and staining.